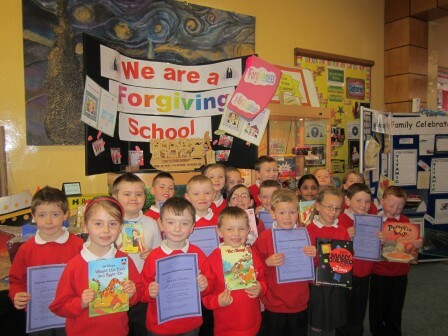 I noticed that your most recent blog (Christmas Day, 2013) talks about forgiveness education in Belfast. If others such as myself were interested in starting forgiveness education in our little area of the world, what would be some of your key suggestions? Anyone can help to start forgiveness education in their own community. If you visit our Store section of this website, you will see that we have professionally-produced curriculum guides for teachers from pre-kindergarten (age 4) through grade 11 (using United States language here) (grade 11 includes students at age 16-17). These guides can be used effectively by teachers who are motivated to spend up to one hour a week for about 12-15 weeks instructing students. Each teacher guide uses stories that are appropriate for the grade level. If the books that are recommended in each guide are too expensive, we have professionally-produced book summaries of each one. The summaries are about 2-3 pages long and get at the gist of the stories (as far as forgiveness is concerned). In impoverished and conflict-zones of the world, we give all of the above materials away for free—no charge and no hidden costs. For others, we ask for purchase so we can continue serving contentious regions of the world. You also can access teacher evaluations of these programs in the Education section of the website and you will see that teachers are very favorable to these programs. Consider taking courage in hand and bringing a sample of the teacher guides to a local school (along with the teacher-evaluation information). Tell the principal or teacher about the objective of forgiveness education: to help children grown in the virtues of love, mercy, and forgiveness, which can reduce student anger and increase academic achievement. Tell the principal or teacher that we provide free materials (if they are in an impoverished or contentious region). Further, we at the International Forgiveness Institute are willing to provide Skype training sessions to groups of teachers who are interested. Busy….busy….busy. No time to just sit and abide in each other’s presence. With all of our labor saving devices it is hard to believe that we have so little time for each other on a deep, meaningful level. This can be corrected by willing a change. We at the International Forgiveness Institute suggest a 10 minute (or more if the conversation develops) couples forgiveness retreat once a week. Set the day and time and will to stick with it. In that time, discuss your hurts from the past week. Who hurt you and how were you hurt? What did you do about it? Is forgiveness on your radar now or are you perhaps planning to put it on your radar for discussion and work toward forgiving? Support your partner in his or her struggle to forgive. Be a forgiveness motivator and even a forgiveness inspiration. It takes a strong will to do this. The rewards may themselves strengthen your will to pursue this little weekly retreat on a regular basis. We have given as best we can to schools in Belfast, Northern Ireland since the fall semester, 2002. The journey has been a challenging and delightful one. For us, from the United States, to make our way into the hearts of principals and teachers in an area of the world that has known contention was not easy. We were outsiders and they are looked on with some suspicion. “What is in it for you?” was the question asked of us at the beginning of this journey. We had at our side the wonderful Anne Gallagher, who opened school doors for us. She had been in the peace movement in Belfast for some years before us and so she gave us instant acceptance into the schools. Rest in peace, Anne. It has been a joy to see principals, teachers, and students grow in their understanding and appreciation of the virtue of forgiveness, so needed to bind up the wounds of literally hundreds of years of strife. I had the privilege of attending meetings and services in both the “maintained” and “controlled” schools during the Christmas season this year. The word “maintained” refers mostly to private schools that receive some government money. Students attending these schools are primarily Catholic. The word “controlled” refers mostly to what Americans call public schools that receive more government money. Students attending these schools are primarily, but not exclusively, Protestant. In the Christmas services at the maintained and controlled schools there is a celebration of the deepest meaning of Christmas, not just about presents and good cheer. You see, those in each school share this common heritage, yet they do so separately because they lead separate lives. Yet, there is something more here. As I walked through the streets of Belfast, especially once the sun would set (about 4:20pm), there was a kind of coziness to the city. “Merry Christmas, Belfast” is seen in blue lights that are strung across a busy street. Shops play Christmas music that is gently piped into the streets. One is surrounded by the Christmas spirit. This is so different from America in which there is a certain self-conscious embarrassment to share this Christmas spirit, as people on occasion mutter, “Happy holidays” in contrast to the exuberance and un-self-conscious joy that unites a city historically divided. There is much hope for Belfast, I say to myself as I walk along the busy thoroughfares. They share more than a common heritage of conflict and contention. They actually do share the common heritage of peace and love and joy as well. A key now is for each side to begin seeing this common heritage, including the insight that this heritage honors each person as precious, unique, and irreplaceable. The message from forgiveness education is similar: We all have inherent worth no matter what our religion or cultural heritage….or historical contentions. Merry Christmas, Belfast, no matter what your cultural and religious heritage is. May forgiveness be one of the important common heritages as people in the distant years to come look back on their city. Digital Journal, Toronto, Canada – Grace and Edmund Fabian spent 24 years as missionaries on the island nation of Papua New Guinea. The married couple spent all those years developing a dictionary of the Nabak language in order to translate the New Testament to the language of the Nabak. The Fabians were close to completing the project when Edmund was suddenly and tragically murdered by a man they considered a Nabak friend. Grace initially put a pause to her work in order to navigate the country’s judicial system but ultimately she and her four children offered a simple gift to the murderer– forgiveness. Their forgiveness prompted a change within the community. In turn the Nabak people showed her a beautiful model of reconciliation. Grace then stayed in Papua New Guinea with the Nabak people to finish the translation of the New Testament. Is there a difference between forgiving and wishing someone well? I wish my ex-husband well, but I am still very angry with him because he broke the marriage covenant. The late Lewis Smedes in his book, Forgive and Forget, made the point that people are starting to forgive when they wish the other person well. Thus, you likely are at the beginning of forgiveness and this is a positive step. Now you need to press onward toward deeper forgiveness. Try to see your ex-husband’s worth; try to see his emotional wounds which might have contributed to the break-up; try to be aware of any compassion that may be growing in you as you do this work. The result, based on our research, likely will be reduced anger. To grow in any virtue is similar to building muscle in the gym through persistent hard work. We surely do not want to overdo anything, including the pursuit of fitness. Yet, we must avoid underdoing it, too, if we are to continue to grow. It is the same with forgiveness. We need to be persistently developing our forgiveness muscles as we become forgivingly fit. This opportunity is now laid out before you. What will you choose? Will you choose a life of diversion, comfort, and pleasure, or the more exciting life of risking love, challenging yourself to forgive, and helping others in their forgiveness fitness? If you want your holidays to be happier, Dr. Robert Enright suggests giving the gift of forgiveness. While it is helpful any time of the year, it can be especially welcome during the holidays. Enright, a professor of educational psychology at the University of Wisconsin-Madison, pioneered the scientific study of forgiveness–a field that now claims more than 1,000 researchers worldwide. He has spent more than 25 years researching the power of forgiveness and letting go of anger. Enright’s research has shown that practicing forgiveness can reduce depression and anxiety and has also helped cardiac patients have better functioning hearts. “Simply put, forgiveness is good for you,” Enright says. This excerpt is from a UW-Madison News story on the university’s website. Read the full article: “Forgiveness perfect gift for the holidays.” The article outlines the four steps in what Dr. Enright calls “the journey of forgiveness” which he detailed in the self-help book, “Forgiveness is a Choice: A Step-by-Step Process for Resolving Anger and Restoring Hope.” In another of the five books he has written, “The Forgiving Life: A Pathway to Overcoming Resentment and Creating a Legacy of Love,” Dr. Enright’s guidance does more than prepare you for a single act of forgiveness–it explains how you can live the forgiving life.